I keep a daily drawing journal. This is from the day I was ready to post off my skeins to the Ethel Mairet Dyeing Now exhibition. 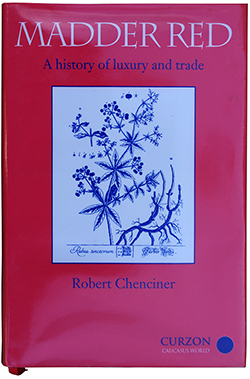 Over the space of about 15 years we have built up a modest collection of books on plant dyeing. I love my dyebooks. Some are stained with use. Others are academic reference tomes to be referred to for inspiration on rainy days. But thanks to the Ditchling Museum of Art and Craft I’ve been working from ‘A Book on Vegetable Dyes‘ by Ethel Mairet originally published in 1916. 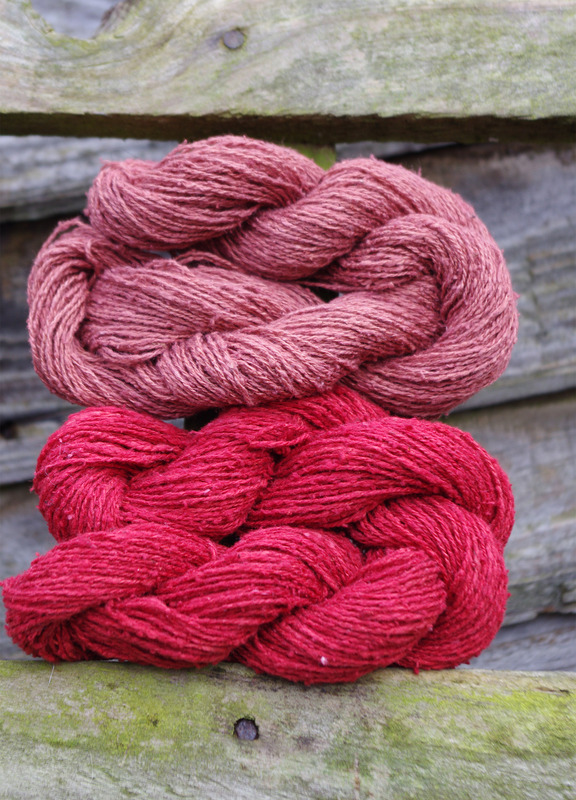 It has influenced just about every book on natural dyeing in the English language since. I first heard of the book at an AWSD Summer School course on Turkey Red with Debbie Bamford, The Mulberry Dyer but I had not thought since to look it up. 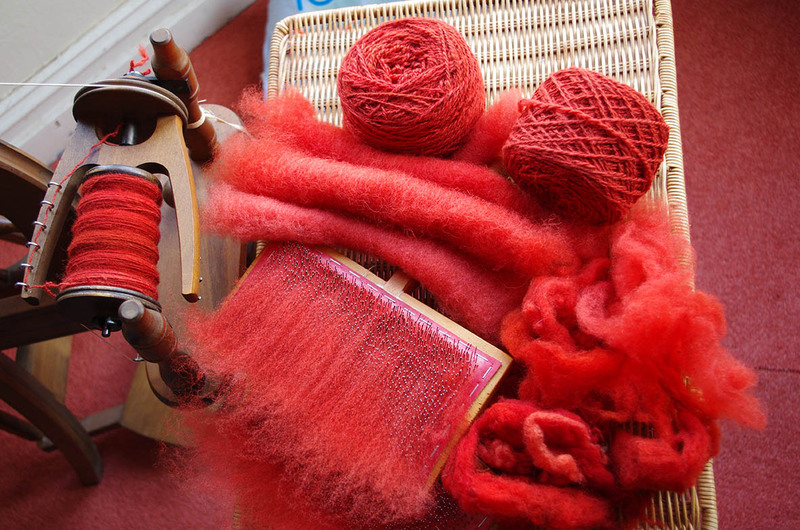 As a centenary celebration, the Ditchling Museum has invited plant dyers to recreate all of the recipes from the book and the exhibition ‘Dyeing Now’ (on until 16 April 2017) has been filling up as skeins of wool, silk, cotton and linen have been coming in from all around the world. 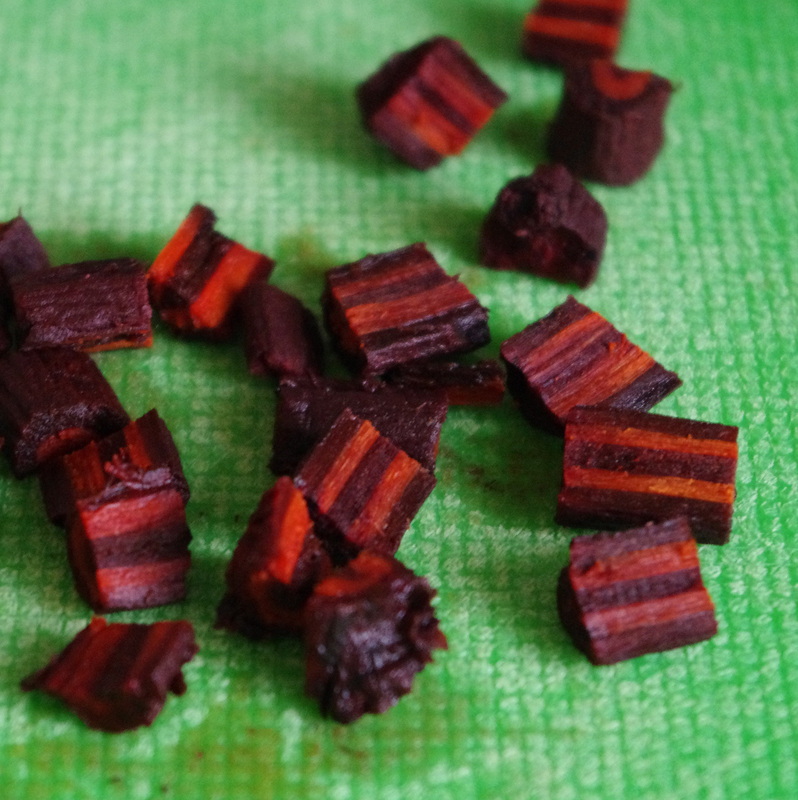 I volunteered early on to do a madder recipe, as I wanted to contribute something dyed with our home grown madder root. 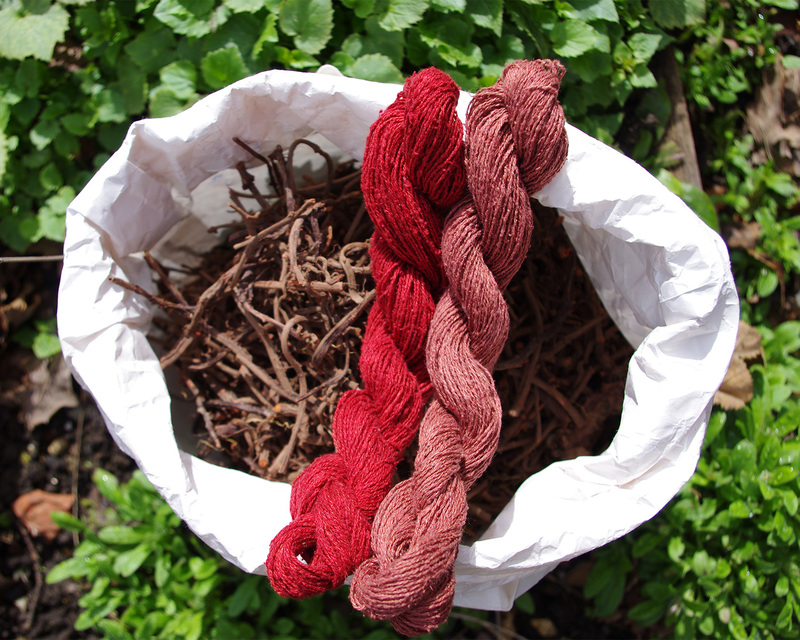 I was duly sent two skeins of wild silk to dye with madder. The appropriate recipe was Recipe 7 on p 103. Last year was tough for various reasons and it wasn’t until a few weeks ago I engaged with the task. 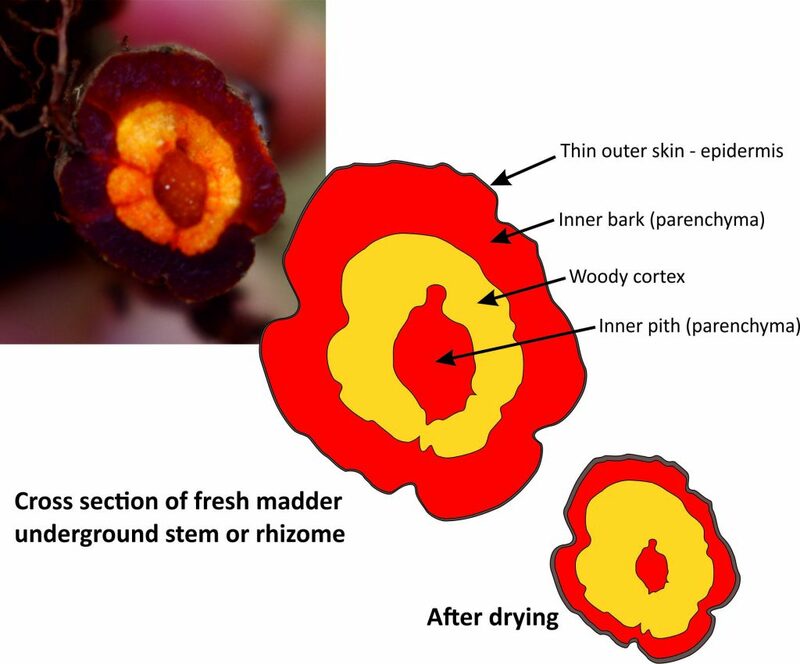 Mairet says little about the preparation of madder, so I decided to prepare the root as per Jim Liles and favoured by Debbie Bamford i.e. several days of soaking, grinding in a blender, heating and straining. Each day yields a fresh extract of dye. Combining them all produces a good mixture of the full range of dye chemicals in the root. 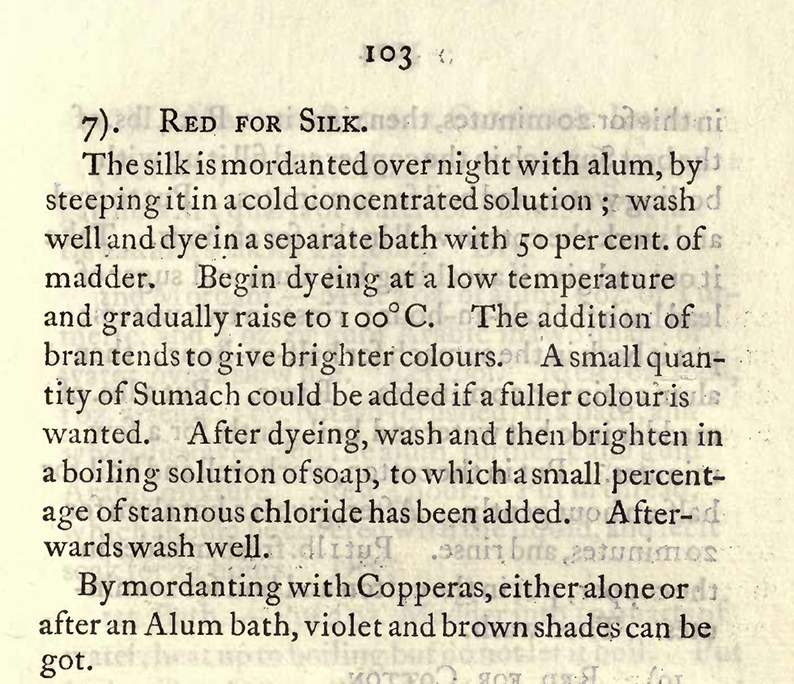 My experience of dyeing silk is that it is hard to get beyond a pink or orange. 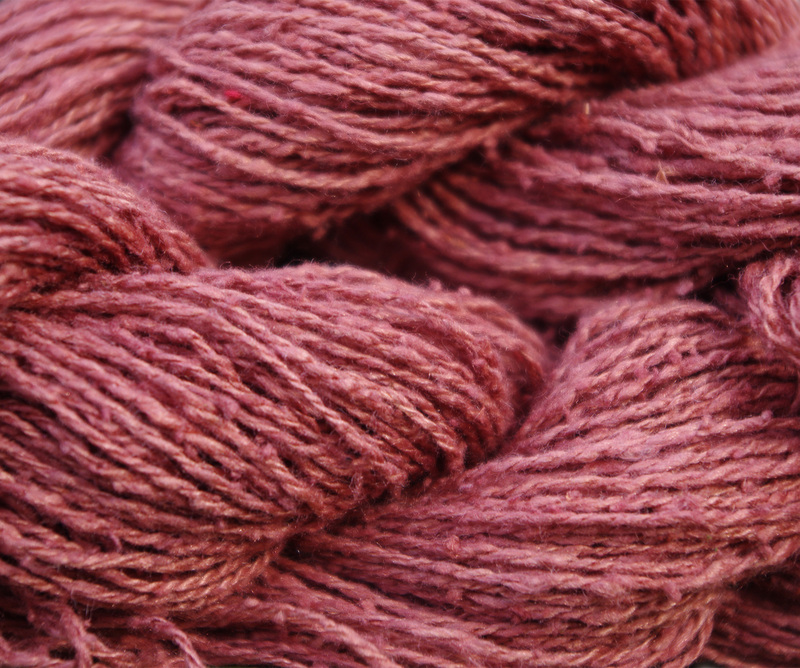 The texture and nature of the wild silk seems to drink dye well. But I wasn’t taking any chances! 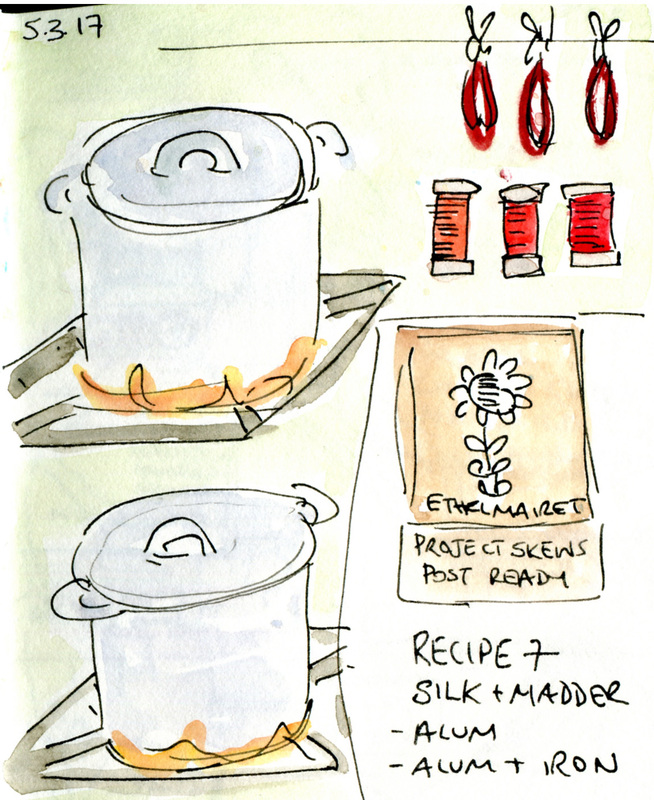 This post describes in pictures my recreation of Recipe 7 for madder on silk from page 103. First I wetted the silk in a little synthrapol detergent in cold tap water. Next I scoured it by simmering for 45 minutes in tap water and rinsed it straight away. Them I mordanted the skeins by cold immersion in alum solution for several days. 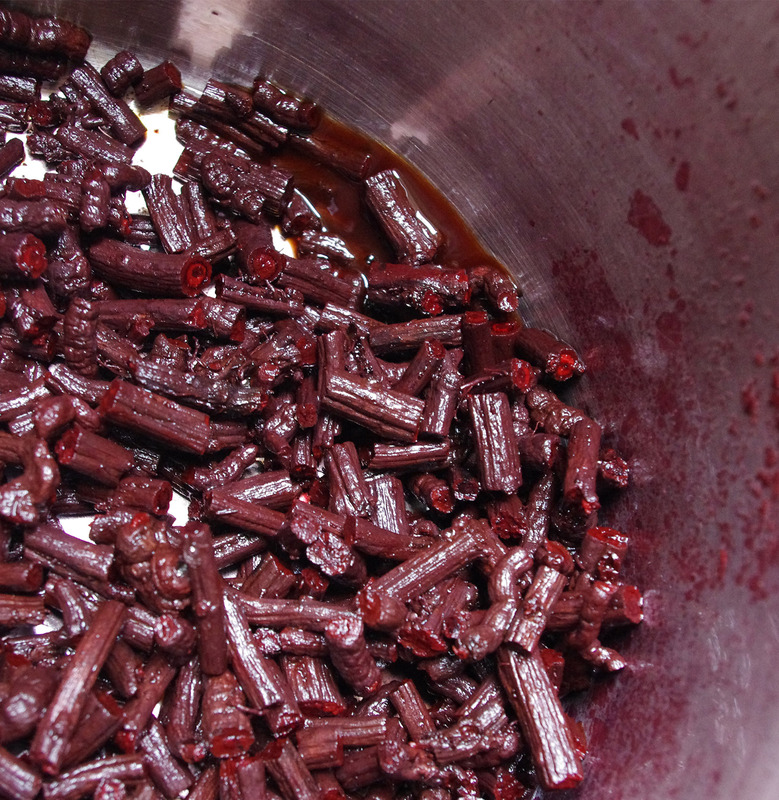 The skeins were then aired (un-rinsed) and re-soaked again in the same mordant solution. 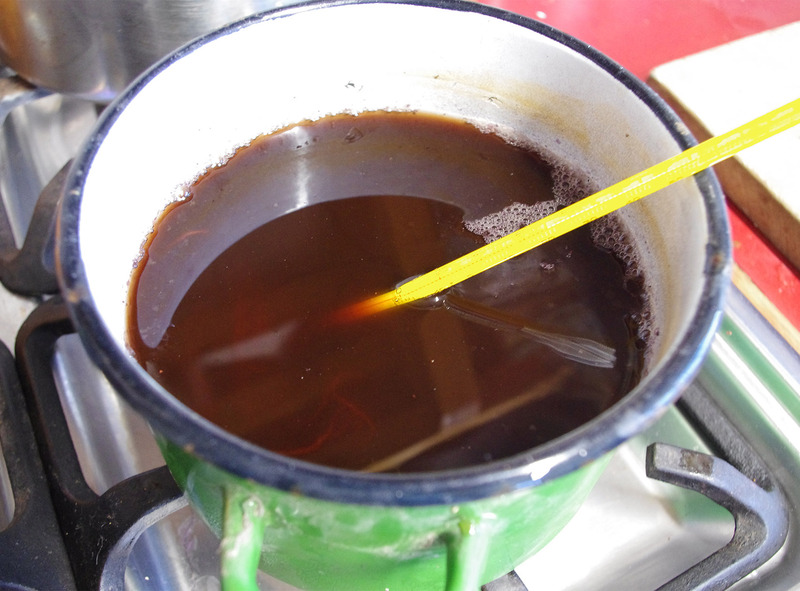 One skein was briefly over-mordanted by heating in 5% ferrous sulphate solution, stirring well to achieve even results. This was removed and rinsed as soon as a suitable pale yellow shade emerged. Iron is harmful to silk and I prefer to restrict its use to vegetable fibres like cotton and linen. 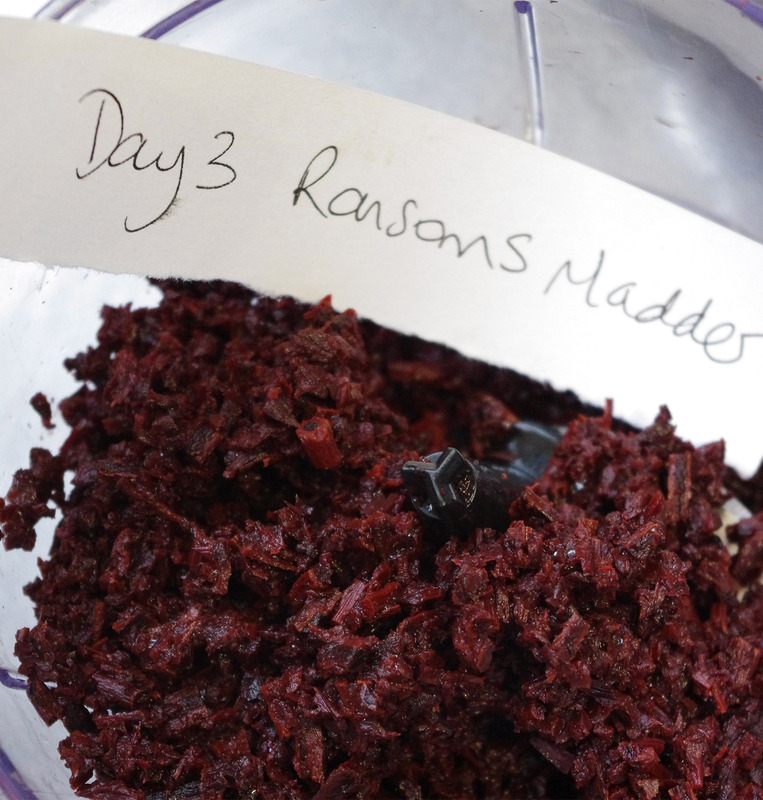 I started with madder dug from our dye garden on Ransoms Rec Allotments in 2011. This ensured it was fully ripened. I broke the root by hand, added boiling water and let it soak overnight. This is next day after straining off the liquid. 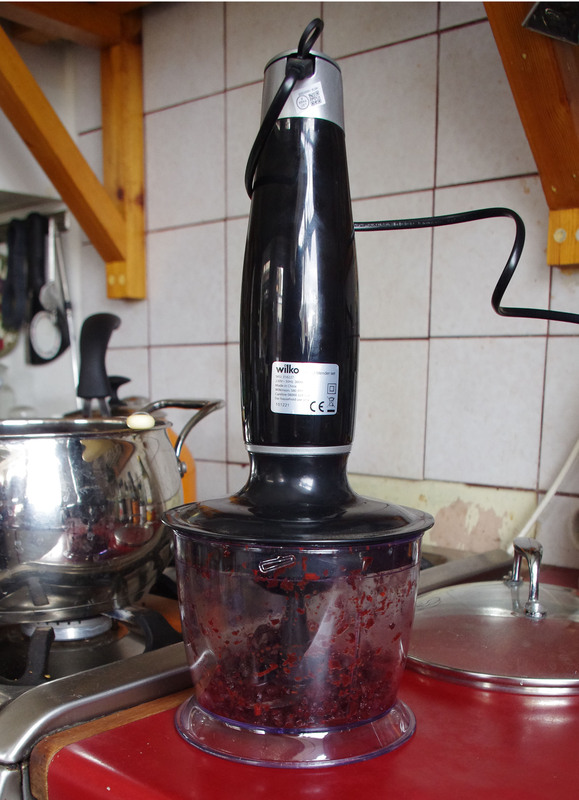 To reduce strain on the blender I cut the softened roots lengthways with a sharp knife. 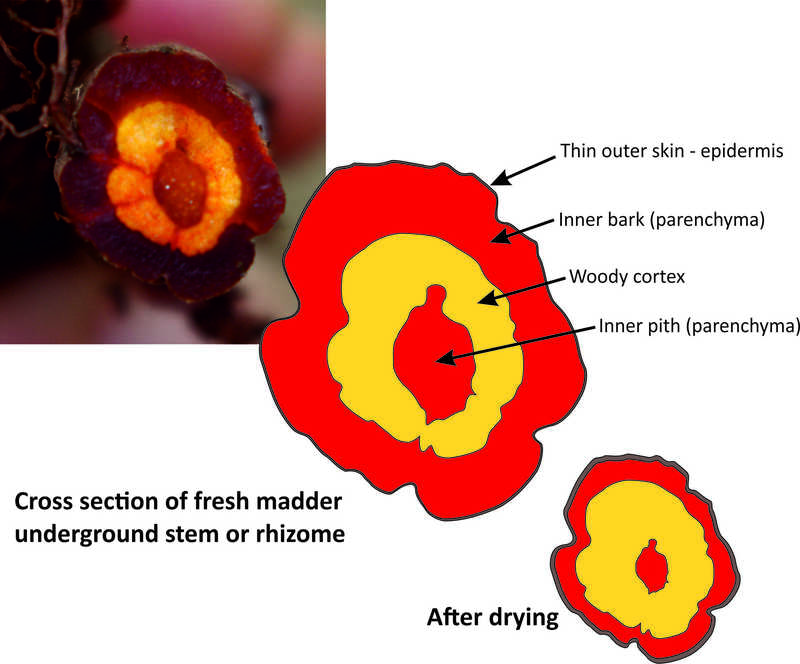 We are after the good stuff in the dark rind and the dark core (parenchyma). The pale orange woody layer has less pigment. First outing for a cheap blender from Wilkos. I doubt it will survive heavy use but being new I could be sure the blades weren’t rusty. The top was annoyingly difficult to twist on and off. The blender came with a handy graduated plastic jug. 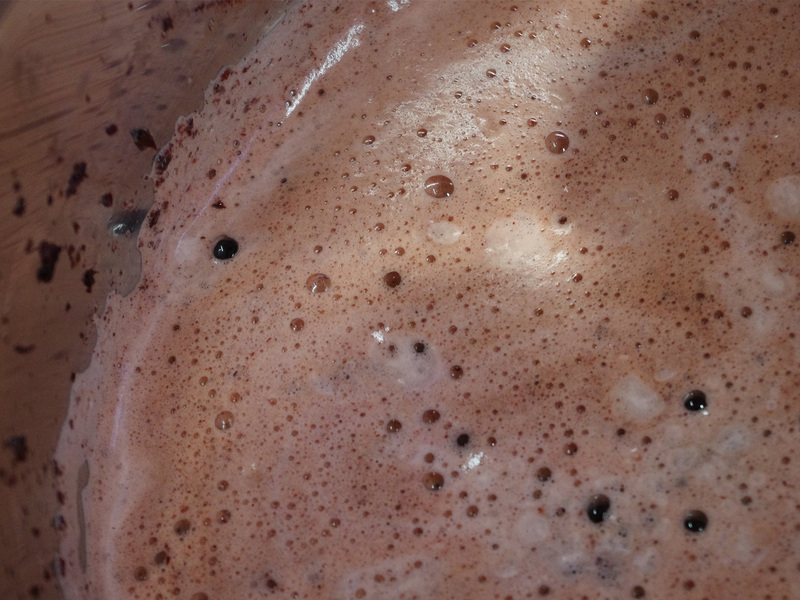 This is the strained liquid after one treatment of grinding, heating and soaking. Lovely colour! Pulp after the grinding on the third day. I ran a parallel batch of commercially sourced chopped madder root from P&M Woolcraft (a favourite supplier) as an experiment. The results were similar. On day four I combined all the liquors and the mashed root in a stainless steel pan. In went a skein. After gentle heating a pale foam appears. 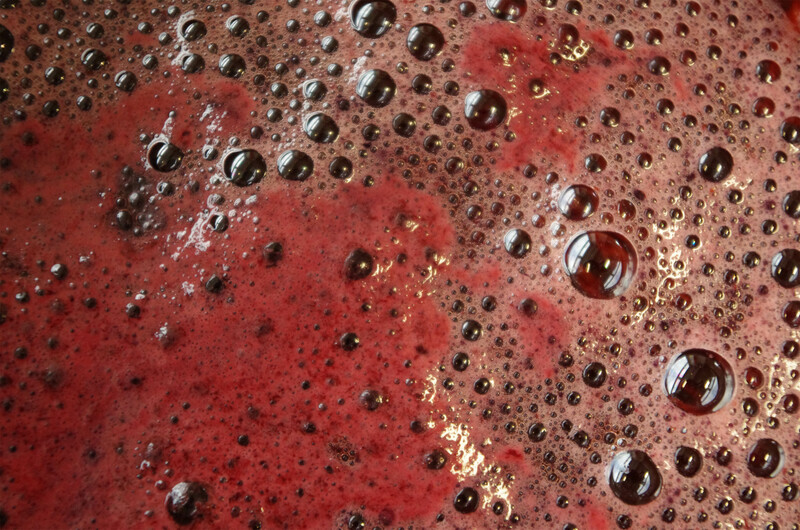 As the temperature rises the foam becomes darker red. The alizarin is the least soluble but most valuable of the red pigments in madder. 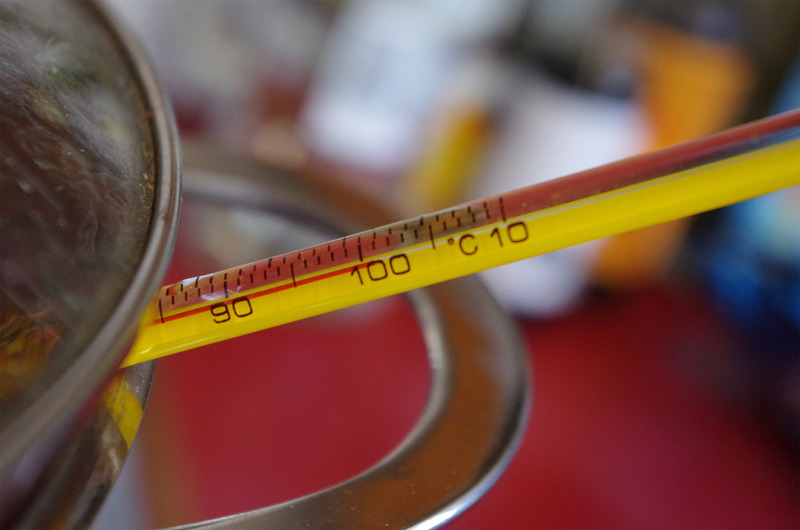 Solubility increases with temperature so a madder dyebath typically starts out pale orange but gets redder and redder as the temperature rises. Bring the temperature up slowly over at least an hour to 82 deg C. Then boil for the final 5 minutes. I ignore all warnings in dyebooks to keep madder dyebaths below 60 degrees C. Heat is necessary to release the best reds into solution. We have hard water which also helps. 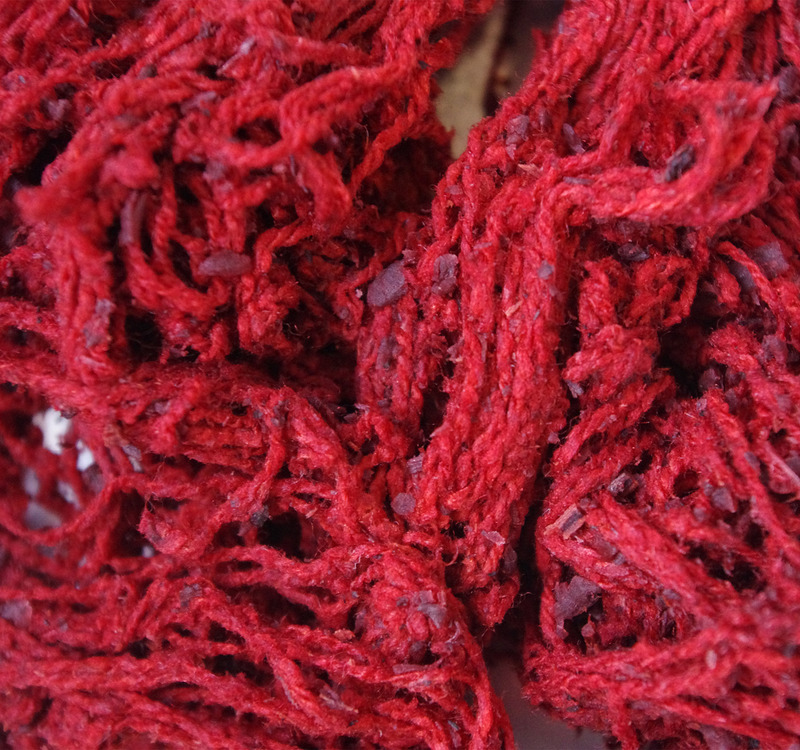 Silk yarn after an hour in the madder dye pot. 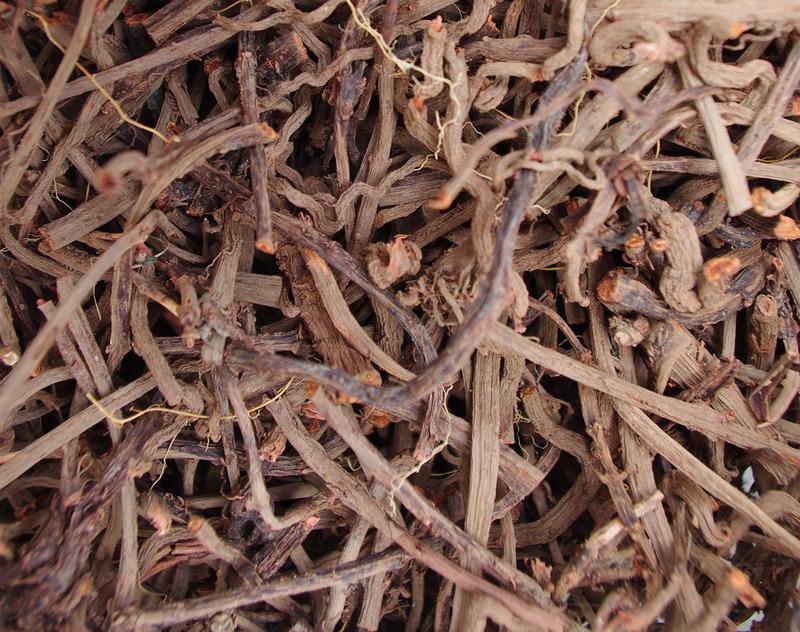 The pieces of madder root shake off when dry. Afterwards, I brightened the skein by heating in a soapy solution with a teeny weeny amount (just a few grains) of tin mordant in the form of stannous chloride. This is toxic so all suitable precautions were taken. I keep an enamel pan just for dyeing with iron. 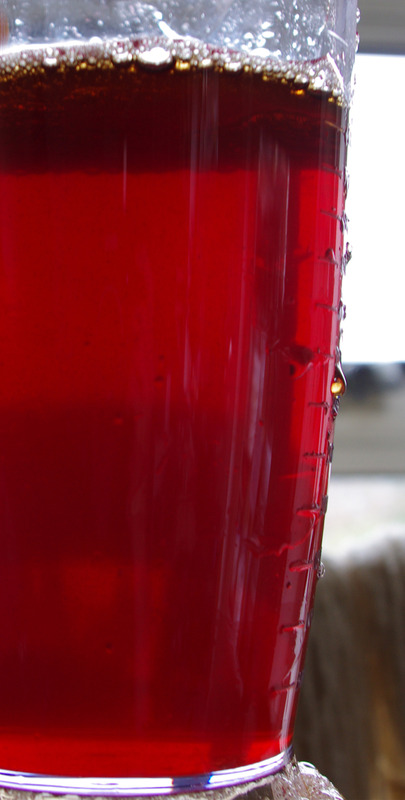 This is the exhaust dye liquor from the previous process used to dye the iron mordanted skein. 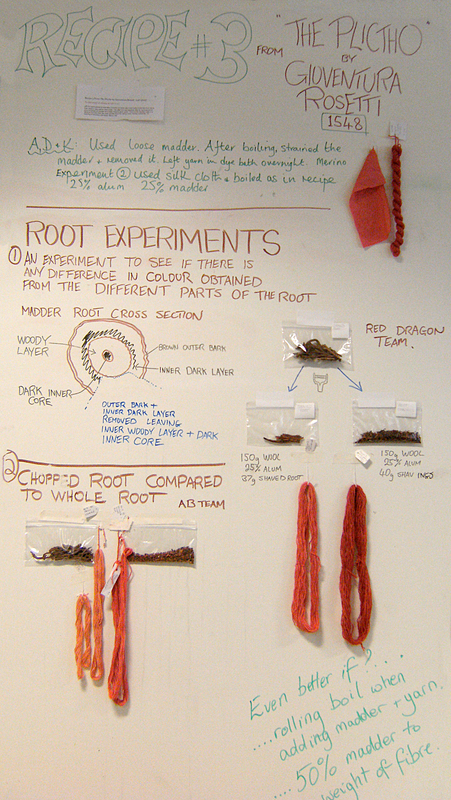 Ethel Mairet’s Madder Recipe 7 on alum mordanted wild silk. Evening sun makes it glow rather well. 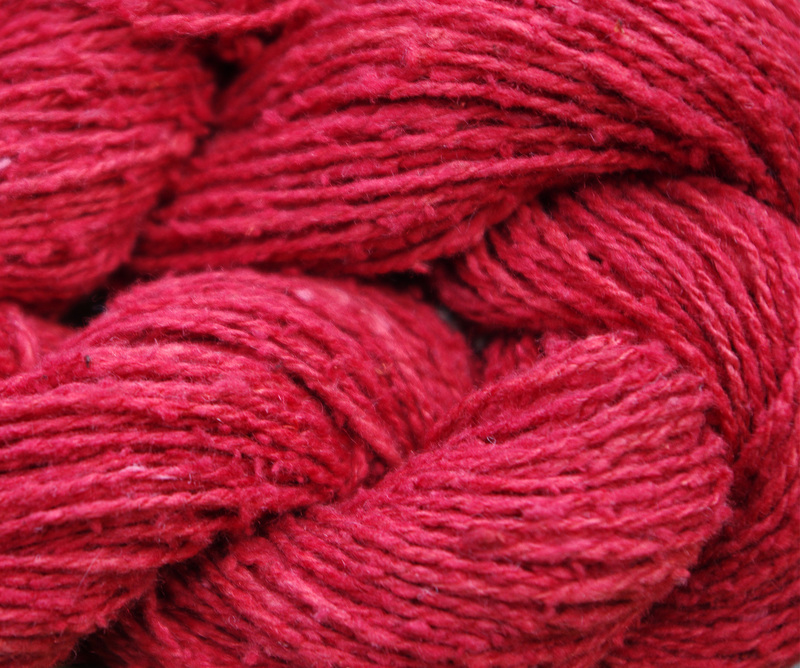 Close up of madder on alum mordanted wild silk. The lighting makes a huge difference to the perceived colour. This was taken outside on a different day to the previous picture. Close up of madder exhaust on alum and iron mordanted wild silk. 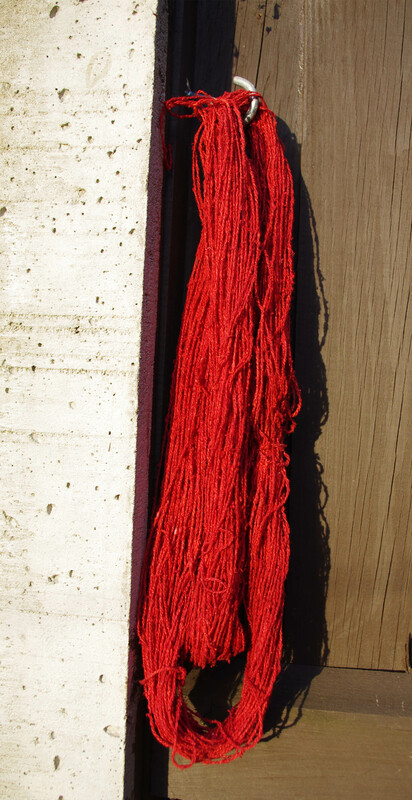 Photographed at the same time as the red skein shown above. Madder on wild silk. Exhaust bath with iron mordant above and madder on alum below. The finished products alongside the raw material. Plenty more dye to look forward to using. 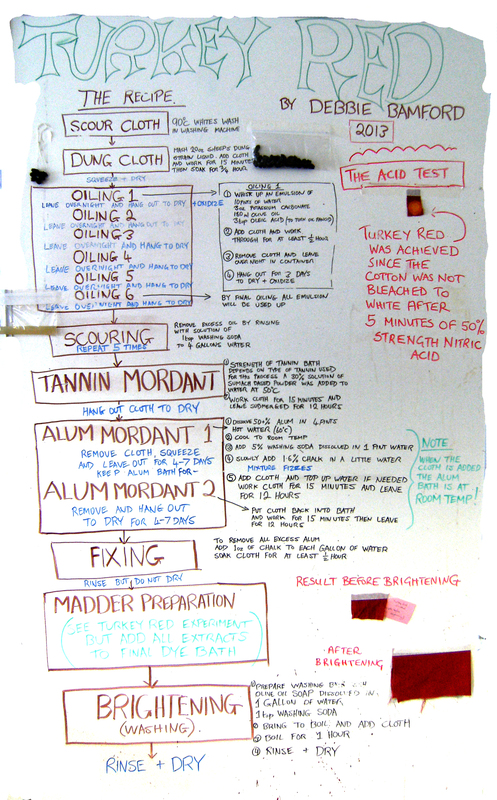 This entry was posted in daily drawings, history of dyeplants, madder on 9th March 2017 by susan dye.